Come with us on an underwater world of discovery. 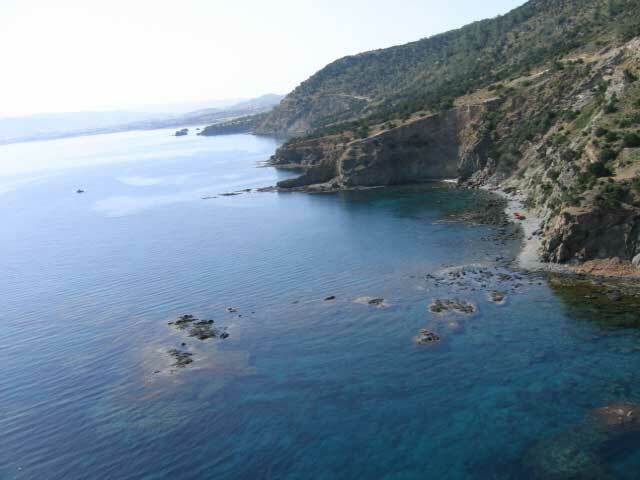 The Akamas Peninsula has some of the most amazing dive sites in Cyprus. 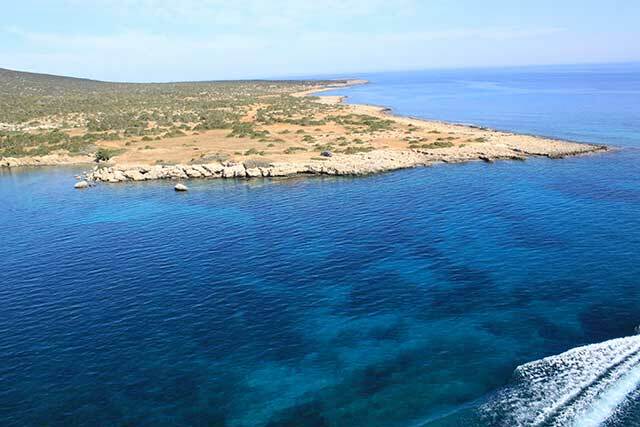 In fact, people travel here from all around Cyprus and Europe to enjoy diving in the pristine waters that surround this nature reserve. Whether you are diving for the first time, or are and experienced diver. You'll marvel at the clear water at all these fabulous dive sites! The east/south side of the island offers excellent tunnels. Swim through the huge schools of fish, including cornet fish, squid, bream, tuna, grouper and even barracuda! Most of the marine life can be seen between 10-15m. However, for the more adventurous diver there are 16th century anchors at 42m. One of the most interesting dive sites and where a diversity of underwater features can be found at St. George's Reef. A maze of shallow swim throughs and small canyons start off the dive. Keep your eyes open for pieces of ancient amphora along the reef. Then you continue on to a sandy area where there are the remains of an old 38ft yacht that sunk only 12 years ago. Many groupers and crabs have made a home under the remaining bits and pieces. Maximum depth is 10m. 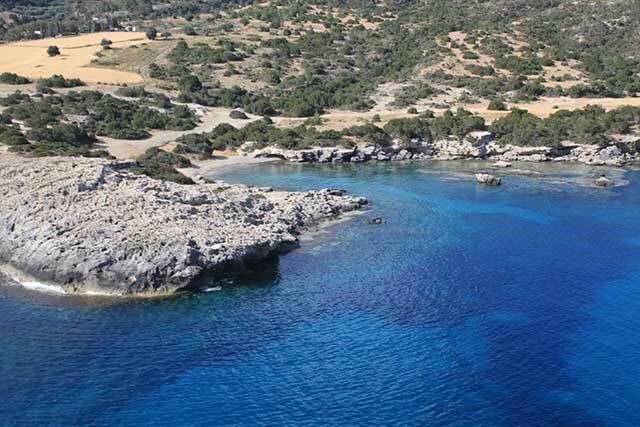 Ampitheatre Bay dive site was originally a Roman stone quarry. In much later years it was handed over to the British Army who used it as a firing range. If you look close enough in the shallows you will still find old, used ammunition! There are 3 bays under water. The first to 15m then to 18m and the more experienced divers can continue down to 30m. The landscape changes from bay to bay offering different things to see in each. Moray eels and octopus are often sighted here, along with damselfish, flounder, sea stars, nudibranchs, sea snails and sea cucumbers. The fabulous blue lagoon will make you feel like you are in the Caribbean. Pristine white sandy bottom and crystal clear water! This dive site is great for training dives, or for an easy second/third dive of the day. It has a maximum depth of 7m. However, this makes for a nice long dive around the island in the middle of the blue lagoon. A nice detour is a big cave in the middle of the island around 5m. The usual suspects can be seen here; including octopus, moray eels, damsel fish, bream, tuna, many hermit crabs and if you are lucky perhaps even a ray! Translated as “the fountain of love” (fontana amorosa), this site used to be an old roman port with a freshwater spring nearby. The romans would come in, get their fresh water and then throw their amphora over the side of the boat as a gift to the gods. Many pieces of these amphora’s are still on the seabed today. Some of them have grown into the reef while others require a little digging to uncover. The max depth is 15m with a very nice gulley to swim through on the way back. Big groupers can be found hiding in the gulley and stingrays have been spotted in the sandy areas. This old barge is only 20m in length, but she is lying upright in 30 metres of water and makes for an interesting dive if the weather is right. As legend has it, if you swim around the rock 3 times the next person you meet will be the love of your life! This dive site is great as a relaxing second dive. This large volcanic rock goes straight down to the sand, making for a nice and shallow wall dive. The maximum depth here is 10m. Turtles are often spotted here during mating season, ask us about renting a DPV (scooter) to search for them! 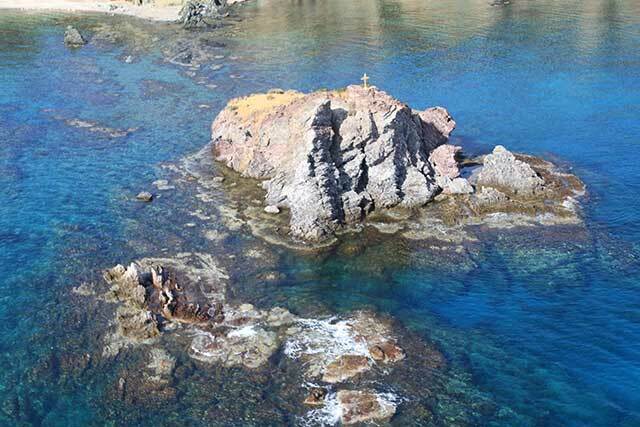 Primarily used as a beginners site because you can walk into the water from the boat in this shallow cove. The underwater topography is quite interesting with many nooks and crannies to search for marine life. The maximum depth is 8m. Newly discovered but one of our favorites! 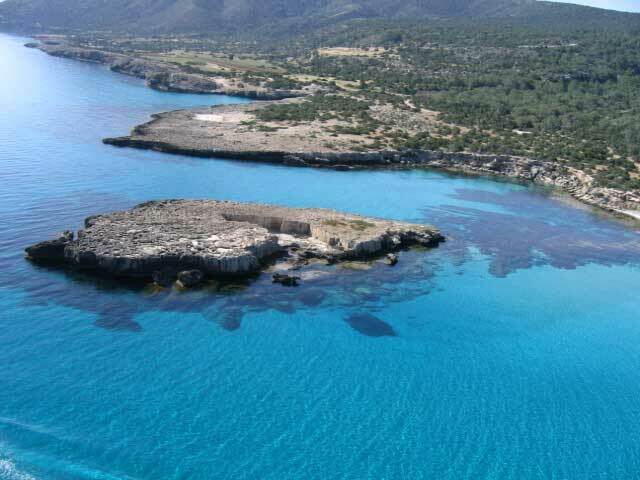 We believe that this site served as a harbour in the bronze age. Back then ships used stones as ballasts and there are several remains underwater that resemble old boats that sunk upside down and after thousands of years have grown into the rock. After a tour of the boat graveyard you will pass some bronze age anchors. 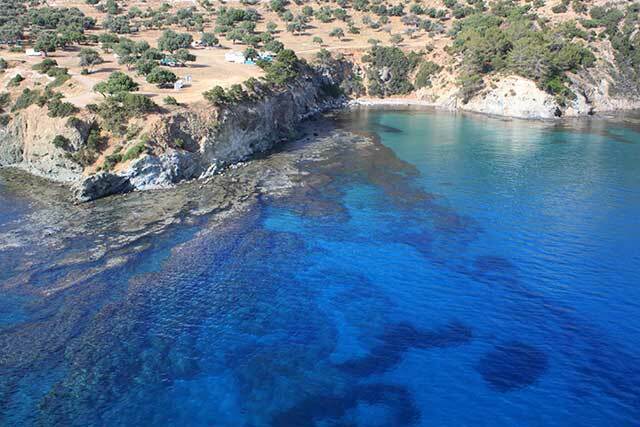 Finish off this 12m dive in the shallows where there are loads of pieces of ancient amphora. This dive site is a lovely infusion of canyons and gulleys snaking down to a maximum depth of 15m. 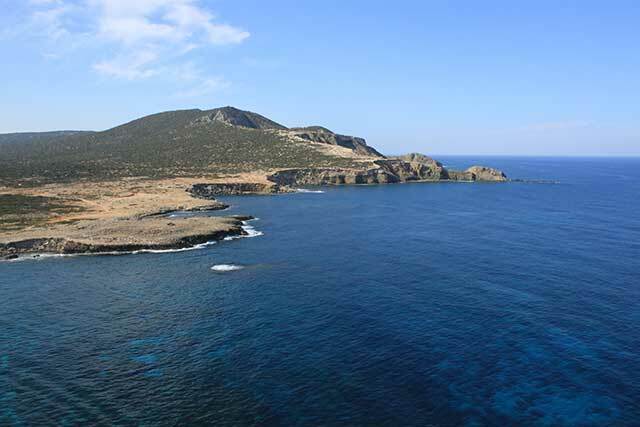 As the name suggests, the underwater landscape is filled with volcanic black rocks that have become home to many interesting fish species. This dive site is strikingly different from the other dive sites in the area because of it’s unique location. The reef is located approximately 200 metres offshore at the very tip of the cape where the harsher seas of the western edge meet the protected seas of the interior of the bay. 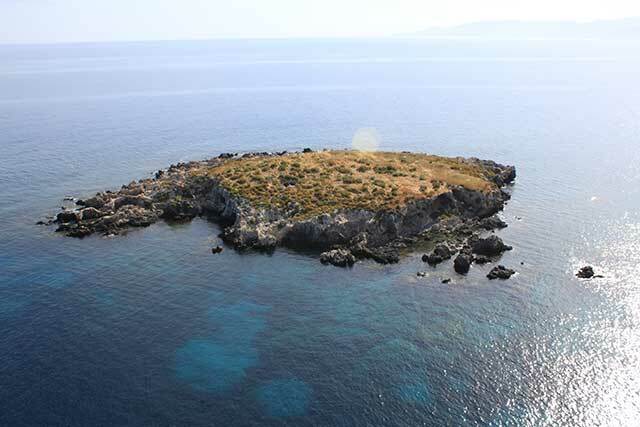 Two dives can be made at this island to a maximum depth of 18m. The island boasts lovely marine life with a good chance of spotting turtles. For the more advanced diver, this site also has some challenging swim throughs where the current pushes you through like a washing machine. A little bit of everything awaits a diver in this diverse bay. There are three different dives in the area with a plethora of caves, swim throughs, blow holes, canyons, gulleys and a wall dive. With all these incredible underwater features to excite you it might be difficult to keep an eye out for the marine life, but if you do you may see turtles as this bay is a protected habitat for them. Maximum depth is 20m.